Aunty Mary tells her story about her nephew with ARF, illustrated with cartoons and photos. Information you should know if your child or family member has had acute rheumatic fever or rheumatic heart disease. 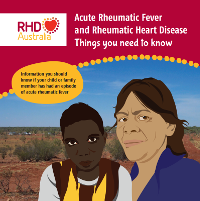 For further information or to access a copy of this resource contact the RHD control program in your area or RHDAustralia: http://www.rhdaustralia.org.au/rhd-programs.